Tabula Rosa, restaurant, and pizzeria newly managed by the HLL Hotel Lungo Lago in Lecco on the eastern branch of Lake Como. The name Tabula Rosa is a play on words of the Latin phrase Tabula Rasa which means “a clean slate“. There are two dining rooms and a round party table in a private corner for nine. The front dining room is a glass enclosed terrace. Light wood floors add to the day-time patio mood. In the near future, the breakfast buffet will be served here for the hotel guests. The main dining room has dark wood floors and furnishings set with ivory linens giving it a warmer atmosphere. I was invited to try their specialty, which is a menu for two of mixed Paella with chicken, prawns, and muscles. I was with my colleague, fashion blogger and photographer, Eva Lako. 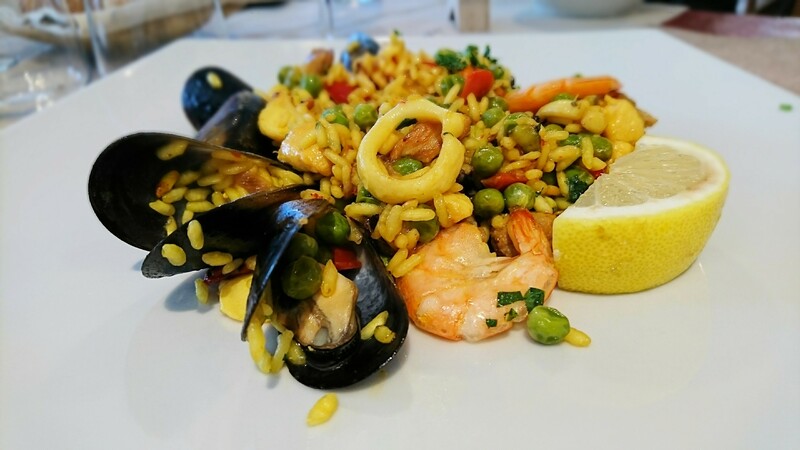 The Paella was made with al dente rice, fresh fish and vegetables. Lunch was accompanied by a glass of prosecco and water, followed by an espresso. The menu also offers pizza, pasta dishes, a gourmet Chianina burger, other main dishes such as meat, fish or vegan options. In addition to hotel guests, there were also locals enjoying their lunch break. I haven’t eaten at Tabula Rosa in the evening, but I believe it could offer a pleasant atmosphere for the dinner crowd. Conveniently located next to HLL Hotel LungoLago, Tabula Rosa offers something for everyone. Many thanks to Tabula Rosa who kindly invited LakeComoStyle.com to experience their specialty. All opinions of the author’s experience are her own and have not been influenced in any way.